The following is a guest review written by "Griff." Griff's review does not represent the thoughts or opinions of Review Spew. But it just so happens that I agree with this review wholeheartedly. About every three years there is an event that causes the world stand still. People everywhere put down their weapons of war and put aside their political differences. They call in sick to work and gather their spouses, sons, and daughters around the family Ipod so that they can claim they were the first. They were the first to hear the new Radiohead album and spew their praises all over the internet. Of course I’m being hyperbolic here, but no more so then the copious adulations that greet every instance that Thom Yorke and company decide to record and release a collection of sounds. 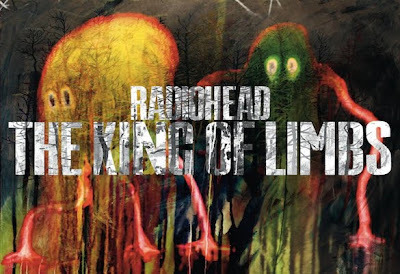 The latest album, “King of Limbs”, is no exception. The critics and most passionately the bands loyal fans all confirm the seemingly unquestionable truth that the latest album is the latest in a string of genius that dates back to the band’s 1995 album, “The Bends.” With a band of Radiohead’s caliber its difficult for a critic, especially one who is a fan of the band to be truly objective, but I’m going to give it a try. Before continuing I need to confess that it is difficult for me to listen to Radiohead without my fan’s headphones, the auditory equivalent to beer goggles. My fandom began later then most fans. I’d heard their previous work, but the first album that I truly absorbed was “Kid A.” I loved it. It sounded like nothing else. The blips that opened “Everything In Its Right Place,” the driving rhythm and free jazz horns of “The National Anthem,” the solitary acoustic guitar buried under the electric ambience that characterizes “How to Disappear Completely,” and the non club techno of “Idioteque,” were what finally set Radiohead apart from all their peers and imitators. Of course I was prompted to go back and really listen to their previous work, which as a guitar head I thoroughly enjoyed hearing the three guitar interplay of Yorke, Johnny Greenwood, and Ed O’Brien on tunes like “Paranoid Android,” “My Iron Lung,” and “Just.” “Amnesiac” followed “Kid A” and once again my ears were treated to a sonic smorgasbord of electronics, mournful vocals, and creative instrumental interplay. “Hail To the Thief,” came when my musical interests were directed elsewhere, and while it had some good moments, it wasn’t enough to redirect me back to the Radiohead cult. By the time “In Rainbows” came I figured Radiohead was beyond their prime but that their music would always be worth a purchase. To say the least I was presently surprised by the beautiful, melancholic, and futuristic pop of ditties like “Reckoner” and “House of Cards.” It turned out to be what in my opinion was their strongest collection of songs since their nineties heyday. The album opens with frantic piano, heavy bass, and the electronic beats of “Bloom.” Thom Yorke’s unmelodic singing follows and the mood for the album is set. (Keep in my mind I’m not trying to insult Yorke here. There doesn’t always need to be a melody for a song to move you.) “Morning Mr. Magpie,” continues the trend of heavy bass and electronica, but this time Yorke’s vocals are more conventional with a hint of anger. “Little By Little,” is the first track that would probably catch the pop-oriented listener but it tends to wear out its welcome when it moves beyond the three minute mark. “Feral,” is a bit formless in the melody department but Phil Selway’s drumming sounds like a funky jazz drummer discovering techno. Pretty cool stuff. The album’s first single, “Lotus Flower,” begins the second half of the album. While I don’t want to tear off and set my ears on fire while I listen to it, the song is actually quite pleasant, I can’t think of anything about it that stands out. This leads to my two favorite tunes on the album. “Codex” is a haunting piano ballad that recalls “The Pyramid Song,” while the spare acoustic strumming of “Give Up the Ghost,” hooks you into Yorke’s foreboding pleas of, “don’t worry.” “Separator,” closes out the album and once again, it’s a rhythmically interesting and listenable track, but I can’t pull anything out of it that makes me want to recommend it for repeated listening. I too would rate this as a 3-star album. OK Computer still ranks as my #1 album of all-time. It must be listened to in its entirety to appreciate it. I consider it Radiohead's magnum opus, and all subsequent albums have left me wanting. Although, I am probably not the best judge of music according to music elitists. Other bands in my top 5 albums of all-time include Midnight Oil, Smashing Pumpkins, Foo Fighters, and Ben Folds Five. Oh...and my first music purchase was a Tiffany cassette tape. My favorite song is "Ace of Spades" Lemmy is awesome...wait, maybe that was Motorhead. Ok, first of all, I love the way this article is written. Thanks Griff! I think you may be a literary, reviewing genius. Let's see some more! PS. If you haven't guessed, I totally agree. Rock on, Radiohead, you continue to make my world go round.